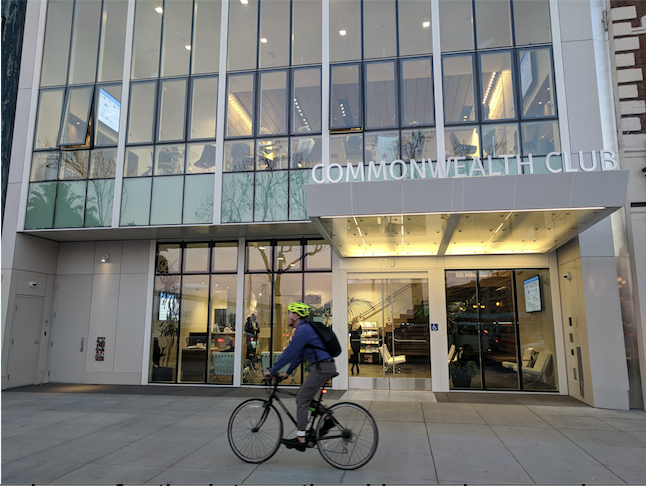 The Commonwealth Club’s newly built headquarters at 110 The Embarcadero opened in September 2017, after six years of fundraising, planning, design and construction. We are very excited about our new home. It is a “home for ideas,” bringing daily debate and discussion of important issues into the center of our community, on San Francisco’s beautiful waterfront. Since its founding in 1903, The Commonwealth Club has rented space in various buildings in downtown San Francisco, including in the St. Francis Hotel and the Monadnock Building. Early plans to acquire a headquarters building were derailed by the earthquake and fire of 1906 that destroyed much of the city. The dream of having our own home never died, and in the 1980s then-President Shirley Temple Black revived plans for a building. But it wasn't until its eleventh decade that the Club was able to finally make its dream—more than a century old—come true. After an extensive search, in 2012 the Club purchased a 1910 building at 110 The Embarcadero on San Francisco's waterfront from the Accornero family, which had owned it for more than 70 years. The Club then embarked on constructing a mostly new building, while preserving a historic facade. Our architect was Leddy Maytum Stacy, winner of the 2017 National Firm Award from the American Institute of Architects. The new building has 24,000 square feet of interior space. It features two auditoriums, a rooftop deck and garden, an art exhibition area, multiple informational video screens, several informal gathering spaces, and a state-of-the-art Meyer Sound audio system and high-tech communications platform. It is LEED Gold, with a specially designed window system for cooling the building with fresh air. 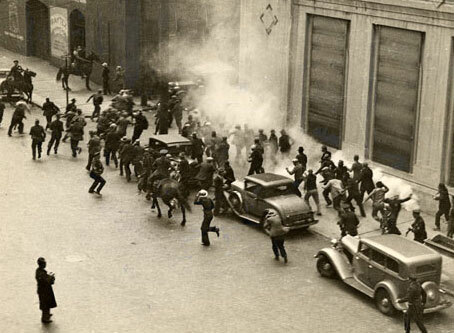 Strife between dock workers and employers in early 1934 quickly led to strikes, then tragedy, and eventually stronger laws protecting the rights of workers to organize and to strike. Longshoremen—seeking higher wages, the right to have union hiring halls, and other rights—strike. President Franklin Roosevelt intervenes to end the strike, and the longshoremen heed his request; but within a couple months they call a new strike after their demands are not addressed. Though the relationship between workers and their employers was already tense, Bloody Thursday (also known as “the battle of Rincon Hill”) was the impetus that led to a general strike. It also swayed public opinion in favor of the workers. On this day, attempting to protect strikebreakers, police pushed picketers up Rincon Hill, the crowd ultimately making its way toward Steuart and Mission streets. Here, just outside the International Longshoremen's Association (ILA) headquarters—the site of our new building—two men were shot and killed by police. The bodies of Howard Sperry and Nick Bordoise, the two men killed on Bloody Thursday, lay in state in our building. More than 40,000 people participated in a funeral procession, in which the caskets were carried through the streets of San Francisco. Union leader Harry Bridges, whose office was in the ILA headquarters on the Steuart Street side of our building, headed the Joint Marine Strike Committee, through which the ILA and its members organized a general strike that shut down the city for four days. The general strike was a concerted effort, with the participation of more than 30,000 workers, including teamsters, butchers, laundry workers and others. At first, the mood was celebratory, but over time the public felt inconvenienced by the lack of goods and services. Newspapers printed inflammatory rhetoric aimed at shutting down the general strike, and there were raids on local businesses accused of having “red” ties. The General Strike Committee voted to end the strike. Teamsters returned to work on July 20, and the longshoremen returned on July 31. Arbitration soon followed. After arbitration, the longshoremen’s pay finally did increase, and the workers were guaranteed a consistent work week of 30 hours. The employer-led Blue Book union was dismantled. The strike ultimately paved the way for expansion of worker rights, through the National Labor Act of 1935. The Club was engaged in the 1930s, as it is now, in education and debate on the key issues of the time, such as labor reform. Secretary of Labor Frances Perkins, who purportedly urged President Roosevelt not to use force to end the general strike, spoke at The Commonwealth Club during this period of labor unrest in the 1930s, as did major union leaders such as United Mineworkers founder John Lewis. Harry Bridges spoke at the Club in 1942 on labor and the war effort, and again in the 1950s.